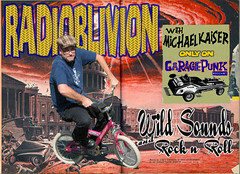 The further adventures of RadiOblivion—Providing Better Living Through Discarded Music—to those who miss Wild Sounds and Rock ‘n’ Roll on the radio. All whilst utilizing a medium superior to radio! So it’s kind of a catch-22, actually. This episode features all killers by such rising stars as: Thee Mysterious Tapeman, the Memphis Morticians, Johnny Lion, Les Arondes, Downliners Sect, Melvin Smith, the Saucers, Satan’s Pilgrims, Troy, and many more pounders!